Each element of a golf course requires different skills and clubs to manage. Professional golf great Tom Watson once said, "A great golf course both frees and challenges a golfer's mind." Every component of a golf course requires a different strategy, swing and club, and the decisions a golfer makes for each can mean the difference between winning and losing the game. The teeing ground, also known as the tee box or tee area, is where golfers take their first stroke for each hole. The ground is level, enabling players to make their best tee shot toward the fairway or green. Most golf courses have one to four tee boxes for each hole identified by colored markers, most commonly red, white, blue and green, although there are no rules governing the number of tee boxes or colors. Each marker is a different distance from the hole. Skilled or professional golfers use the tee box with the longest yardage (often green), while beginners, juniors and some women use the one with the shortest yardage (generally red). Casual players and more advanced women use the tee markers in the middle depending on skill and handicap. Fairways are areas of short, dense grass that extend from the tee box to the green. Although many fairways are straight paths, others have one or more sharp turns known as doglegs that make play more difficult. Golfers who use the term “long game” are referring to the drives down the fairway that ultimately get them to the green. From the first stroke off the tee, a golfer's goal is to get his ball onto the green and into the hole. Designing and maintaining the greens are one of the biggest challenges golf course architects and groundskeepers face. Each degree of slope, variety of grass or method of mowing can make a difference. Greens are often oval- or kidney-shaped, with dense grass cut very short to allow the ball to roll. The hole may sit anywhere on the green, although it is often found near the center. Hazards are the bane of every golfer’s existence. 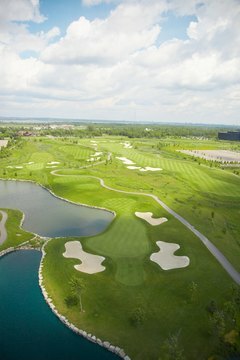 Common hazards include ponds or streams, bunkers--bowl-shaped pits filled with sand--and areas of plant growth where a golf ball can easily be lost. Hazards make it necessary for the golfer to balance the distance from the ball to the hazard with the proper swing and club and land the ball just before, past or on either side. Sand bunkers require the use of a very specific type of swing to get the ball up and out, and the shot is often played with a special club called a sand wedge. The rough is the area that surrounds the teeing grounds, fairways and putting greens. It is often characterized by lush vegetation, long grass and tall trees that make it difficult for a golfer to get back onto playable ground.